I don’t often watch Bill Granger on telly – partly because I get so jealous of all that sun and those beaches, but mostly because my eyes can’t cope with those flashes of brilliant white from his teeth. But I happened to have the telly on one day and out of the corner of my eye I saw him make this sausage recipe. Having just made a double batch of the Italian sausages from Vegan Brunch, I decided to give it a go. 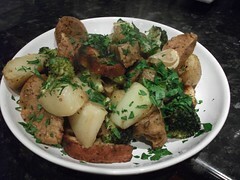 I followed the recipe as is, except I added a head of broccoli florets about 10 minutes before the end of cooking time. I’m vegan, so I wanted some vegetables of course! Another time I would do some sort of light sauce, because I suspect the meaty sausages would have released more juices and made the dish less dry. But for a “throw it all” in sort of dish, it was pretty successful and I almost felt for a minute like I was about to take a stroll on Bondi beach when I’d finished. That sausage dish looks so satisfying!